Our family is fanatics of sea life! 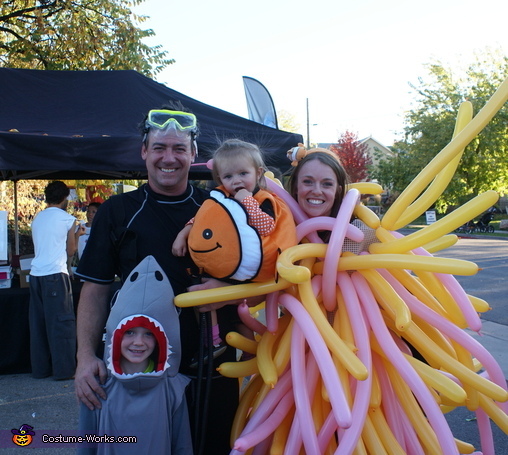 In fact, our 6-year-old son has a dream of becoming a "diver who studies sharks" so it was only fitting to have him dress as a shark this year and when I caught our 17-month-old daughter "talking" to our clown fish, the idea came to me to have our family costume center around the children's love of these animals. I wanted to do something outside the box with regards to finding another underwater creature and since my daughter is attached to my hip most days, I thought a sea anemone would be a a fun idea! I used gold and pink balloon-animal balloons and attached them to rug backing (it has the perfect size holes to pull them through and tie.) I then attached this to a smock so it could easily be taken on and off. It was also a way to make it easy to replace balloons as the week went on. For my husband, we decided that a scuba diver would be a good idea as he is constantly trying to "capture" our children. :) We used 2-2liter bottles for his oxygen tank and spray painted them in metallic silver. We then used tubing and a rubber end piece to make his breathing apparatus all spray painted black. We took empty toilet paper rolls and spray painted them silver for belt weights. He used his own mask for the finishing touch.